Habib Ali bin Mohammed bin Hadi Al-Saggaf. 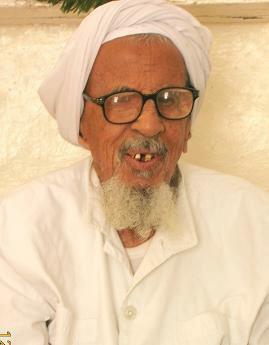 Habib Ali bin Mohammed bin Hadi Al-Saggaf passed away on Monday, 27 February 2012, in Sayun, Hadhramout, Yemen. He was one of the greatest Habaib in the sacred valley of light and knowledge that is Hadhramout. He was also recognised as having exemplary personality traits endowed with piety, humbleness towards Allah and with, par excellence, a moral disposition that immediately created loving compassion with individuals. His far reaching width and depth of knowledge, coupled with innate piety and wisdom in its delivery, inadvertently made him revered and loved. In brief, he inherited the noble character of his forefather Sayyidina Muhammad Sallallahu Alayhi Wa Sallam, may Allah bless him and make his grave one of the Jannah, and may Allah reward us with his Barakah, and having been with him and his grandfather, Sayyidina Muhammad Sallallahu Alayhi Wa Sallam in the hereafter, Ameen.